24 • RV PRO • September 2018 rv-pro.com R V M A N U F A C T U R E R S flooring, paint schemes and a new hardware color. All faucets, drawer pulls and bathroom hardware will be black in response to a trend in high-end motorhomes and residential housing, James says. These changes – along with "one other tremendous surprise," which James would not divulge – will help maintain DRV's momentum from the 2018 season, which saw retail sales rise some 16 percent through June from a year ago, James predicts. "The market has been great and our dealers have done a great job educating their customers about our floorplans," he says. "Our offerings seem to be spot on. We have something for everybody." DRV's demographic has traditionally been full-timers, but that's changing slightly with some younger buyers entering the luxury fifth wheel market, according to James. "That's a plus on our side," he says. "It allows us to think outside the box." Heartland RV Heartland RV – the fourth-largest of Thor's nine subsid- iaries – will likely pass the billion-dollar mark in sales this year, thanks to continued success of its legacy fifth wheels and emerging travel trailer business. Heartland has big news for Open House in both segments. Heartland will unveil its new complete full-profile fifth wheel, the Milestone, at Open House. The unique aspect of Milestone is its price point: Heartland projects MSRPs starting around $50,000. "This is an aggressive price point for what you get," says AJ Jones, senior general manager over the Cyclone, Torque, Sun- dance, Gateway, Terry Classic and Milestone brands. "Typically, you don't see tall slide-outs and big windows until a higher price point. We're trying to provide the luxury you see in high-end fifth wheels but making it economically achievable." Heartland will show three Milestone floorplans at Open House, two of which are bunkhouse models. One will be a two bath, quad-bunk plan, while the other will feature a new mid- bunk and industry-first bath-and-a-half. The third floorplan will feature a raised rear den. "No one is doing this at the price point that we are," Jones says. "Milestone has a more modern, clean look that will make people feel like they're at a high-end hotel." Not to get lost in the Milestone hoopla, Heartland will intro- duce three new floorplans for its Cyclone toy hauler, including Model 4220, nicknamed "The Giant" for its 20-foot garage and one of the biggest bedrooms and kitchens in a toy hauler, Jones notes. The Giant also will feature unique furniture func- tionality, according to Jones. 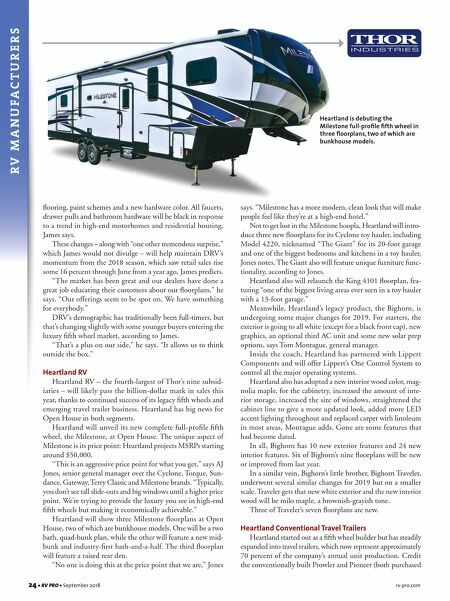 Heartland also will relaunch the King 4101 floorplan, fea- turing "one of the biggest living areas ever seen in a toy hauler with a 13-foot garage." Meanwhile, Heartland's legacy product, the Bighorn, is undergoing some major changes for 2019. For starters, the exterior is going to all white (except for a black front cap), new graphics, an optional third AC unit and some new solar prep options, says Tom Montague, general manager. Inside the coach, Heartland has partnered with Lippert Components and will offer Lippert's One Control System to control all the major operating systems. Heartland also has adopted a new interior wood color, mag- nolia maple, for the cabinetry, increased the amount of inte- rior storage, increased the size of windows, straightened the cabinet line to give a more updated look, added more LED accent lighting throughout and replaced carpet with linoleum in most areas, Montague adds. Gone are some features that had become dated. In all, Bighorn has 10 new exterior features and 24 new interior features. Six of Bighorn's nine floorplans will be new or improved from last year. 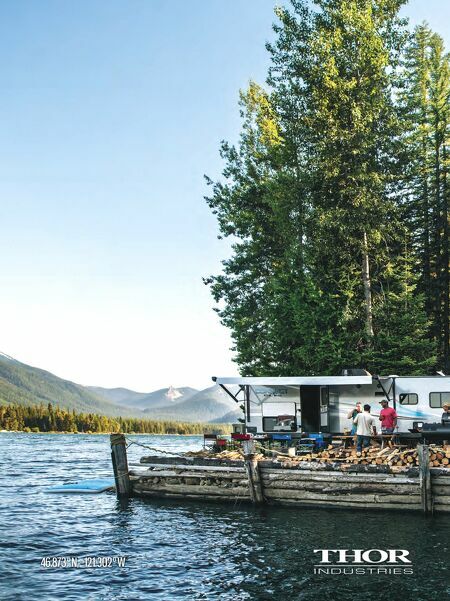 In a similar vein, Bighorn's little brother, Bighorn Traveler, underwent several similar changes for 2019 but on a smaller scale. Traveler gets that new white exterior and the new interior wood will be milo maple, a brownish-grayish tone. Three of Traveler's seven floorplans are new. Heartland Conventional Travel Trailers Heartland started out as a fifth wheel builder but has steadily expanded into travel trailers, which now represent approximately 70 percent of the company's annual unit production. Credit the conventionally built Prowler and Pioneer (both purchased Heartland is debuting the Milestone full-profile fifth wheel in three floorplans, two of which are bunkhouse models.